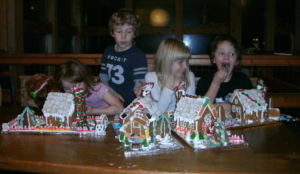 This year will mark our first Solstice Gingerbread house competition…. Winner will be determined by everyone at the dinner. In the middle of winter, when the nights are long, and the days are grey and short, we hold a special celebration on Galiano. This year will be the ninth annual Solstice Potluck. It’s a time to celebrate community and the warmth of togetherness on the darkest night of the year, keeping in mind that at this point darkness gives way and changes back towards the light. For me, Solstice preparations begin when I pick up the organic turkeys from Ireland Farms in Saanichton. The day of the event, we spend the day in the kitchen making bread and soup, cranberry sauce and roast potatoes, but I’m always grateful the dinner is a potluck and everyone comes with something to share. 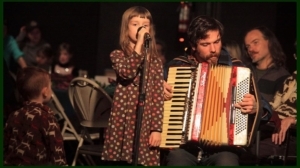 At Solstice we celebrate with a kids’ candlelight parade, a huge bonfire (where you can get mugs of hot soup if you want to stay outside and enjoy being awake in the night), a big potluck feast, and local musicians to entertain us afterwards. It is a community event. Everyone is welcome. It also is a time to reflect on the past year and the ways in which Galiano celebrates community through so many food-focused gatherings and events. There are so many ways that the different generations of our community connect and share food together. And you can help too. Volunteers are what make huge community events like this possible. 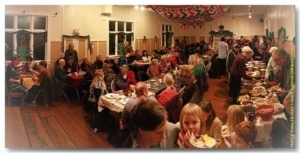 We need help with cooking, hall set up, dishes, musicians, lantern making, clean up…. There are so many ways to get involved. Contact Alison to find out how you can join in the fun. On Sunday December 21st we will gather together to celebrate the Winter Solstice, the night of the longest darkness. On Galiano we celebrate the solstice by gathering together as a community. This is the Seventh Annual Solstice Potluck Celebration. It’s all about gathering with your friends and neighbours, sharing some wonderful food, watching the kids arriving at the hall in a lantern procession, chatting around the fire, and enjoying the music and entertainment of some amazingly-talented locals. One of the ways the dictionary defines community is: “a feeling of fellowship with others, as a result of sharing…” That’s sounds perfect to me. We share this small island. Perhaps we all have different ideas on the best way to live here—but we all choose to be here, together. We all choose to create community together. We are blessed to live in a community that cares about each of us, that supports us when we are sick or hungry, and need an extra meal, a community where hundreds of volunteers work at everything from making food, to running a library, fighting fires, tending a garden, recycling our garbage, or helping at the school. It’s a community where you can always find someone to stop at the bank for you, or bring something home from town, or lend a hand when you need your kids looked after for a couple of hours. We live in a community where people go beyond all the time. Communities like this are amazing—but they are not accidental. Each and every day we make choices about what we can do to share with others, and help build our part of this community, and it is those choices, the choices we make to work together, and create together that make this place such an amazing place to live. Be sure to save December 21st for the Annual Winter Solstice Pot Luck Dinner. The doors will open at 5:00 with the Children’s Lantern Parade leaving GIRR at 5:30. Dinner will start at 6:00 with entertainment after. 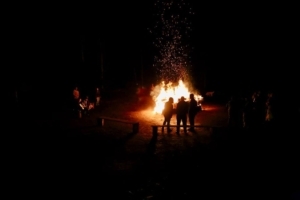 Traditionally on the Winter Solstice, the longest night of the year, people stayed awake all night, keeping a bonfire burning, in an effort to call the sun back. We have a bonfire at our Solstice celebration too, but for me, the important thing that we are calling and creating is community. 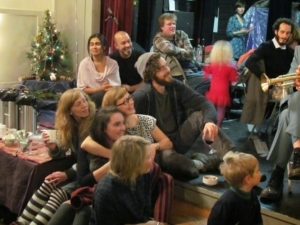 The Sixth Annual Solstice Potluck Celebration is all about gathering with your friends and neighbours, sharing some wonderful food, watching the kids arriving at the hall in a lantern procession, chatting around the fire, and enjoying the entertainment of talented locals. The Solstice night is all about creating the magic of community. It’s that community magic that supports us when we are sick, and need an extra meal, or when the farmers have produce to spare, and volunteers turn it into soup for the community. It’s the magic that happens when you need something picked up in town, insulin brought from the vet, or help when you need your kids looked after for a couple of hours while you work. It’s the magic of a community of people who go beyond all the time. That magic, the magic of the season, is something that exists all year on Galiano. It’s the magic of a community that works hard to take care of all its citizens. The Solstice Potluck Celebration is a recognition of that magic. Dozens of volunteers work to prepare food, help the kids making their lanterns, build the bonfire, decorate the Hall, provide the entertainment, and clean up. Dozens of people come together to create something we all can enjoy. Contact the Galiano Food Program to find out how you can share your enthusiasm, talents and skills for this wonderful community celebration. Everyone is welcome to join in. Be sure to save December 21st for the Annual Winter Solstice Pot Luck Dinner. The doors will open at 5:00 with the Children’s Lantern Parade leaving GIRR at 5:30. Dinner will start at 6:00 with entertainment after. The Annual Kid’s Candlelight lantern parade marks the beginning of the Solstice Potluck. 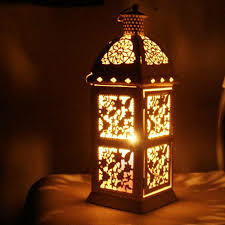 There will be a lantern making workshop on Monday December 9th at the Activity Centre from 3:30pm till 5pm, for all kids that haven’t made their lanterns yet. Please bring a large glass jar (1L canning jar is perfect). All other supplies will be provided. There is no charge for the workshop. The mid-point of the winter is marked by the winter solstice – the time when the sun stands still, marking its southern most point in the sky. The next day’s sunrise finds the light increasing, the sun rising higher on the horizon. It is a time of rebirth and renewal. Ancient celebrations of winter solstice have roots in community and survival. In our part of the world, people were preparing to survive through the lean months from January to April. Food was stored, preserved and rationed. The anticipated growing season was celebrated with a festival for the return to the light. It is true here on Galiano Island as well. At the heart of the Galiano Food Program are the beliefs that it is important to build awareness of the cycle of food growth and harvest; build a community interested and aware of the importance of sustaining people with healthy food; celebrate community by sharing the work involved. The idea of food security, grow and eat locally produced food, support and work alongside those who grow food, sell food and enjoy food is at the core of the work of staff and volunteers. Community building at its best! This year celebrates the 5th year the Galiano Food Program has coordinated a community potluck dinner in this season. In celebration of the bounty of the growing season, the Food Program focuses on creating a meal worthy of the abundance we share here on the island. The first two Christmas dinners were a thundering success. The seasonal celebration has shifted to a community potluck celebrating Winter Solstice. This year, December 22nd is date for the third solstice dinner, held at the South Community Hall. It will be the culmination of a lot of hard work by the staff of the Food Program and the efforts of a number of dedicated volunteers. How can you help? Meals and events of this size (over 100 people last year) only happen because of community support and the people who help. Volunteer activities such as lantern making, bonfire preparation, hall decorating, preparation of some of the meal, entertainment, and children’s activities are essential parts of this event – it takes a community to celebrate! Contact the Galiano Food Program to find out how you can share your enthusiasm, talents and skills for this wonderful community celebration. This year’s dinner is planned for Thursday, Dec 22nd. Doors open at 5pm. Dinner starts at 6pm. The feast will be a Potluck – please bring appetizers and main dishes. If you’re interested in helping out in the kitchen, being part of the entertainment, creating activities for the kids or helping out in any capacity, let us know.